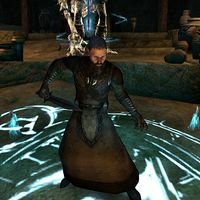 Thallik Wormfather is a powerful necromancer and the leader of the Worm Cult in the Rift, who are attempting to resurrect the giant Sinmur. You will fight Thallik at Arcwind Point during the quest Shattered Hopes. However, in death his spirit becomes bound to Sinmur, making the giant stronger. Using Wuuthrad, you will have to separate their spirits at Trolhetta and fight him again. Following his defeat, Thallik is sent to the Cliffs of Failure in Coldharbour for displeasing his master, Molag Bal. You have the option to take his side and save him from eternal battling. In return, he agrees to aid in the fight against Bal at the Endless Stair. Thallik Wormfather can be encountered in Coldharbour, as a contestant at the Cliffs of Failure. When you first enter the portal the cliffs you can find him conversing with some possibly familiar faces as they observe a trio of restrained mages. High Kinlady Estre: "Your troops grow weak, Thallik. The Worm Cult isn't what it once was. And this mage isn't going to change that." Thallik Wormfather "You throw peasants at me, Estre. You confuse weakness with boredom. My mage will do just fine." High Kinlady Estre: "Believe what you will. When I am victorious and you grovel before me, I will remind you of this moment and how wrong you were." Angof the Undying: "You two bicker like a couple of married old Nords. You didn't even notice the new arrival." High Kinlady Estre: "Another one? Where do they all come from? I swear, they pop up like rabbits." Angof the Undying: "This one is different. Special. I think this one will make a good addition to my team." "My killer comes to humiliate me once again? Well, know that your luck won't help you here. "And here I am, no thanks to you! My connections to the higher powers have granted me a second chance. One I fully intend to use to tear you apart. Piece by piece. You won't stop me again." Isn't that what you said last time? I can't say I blame you for coming to join the game, though. The lure of power. The chance for Molag Bal's favor. You're more like me than I imagined. Ruthless. Power-hungry. A worthy opponent." Otherwise he will be sizing you up as a valuable asset. "Yes, yes. I see, I see. You would make a fine addition to my forces." "What am I talking about? I'm talking about this game of war that we play, fool. Oh, don't tell me you came here by accident? It never ends well for the stupid ones." You expect that to win me over? "Fool, I don't expect to win you over with a smile and pretty words. I expect you to fight for me because of the power I wield. Down in the field, Thallik will be waiting by the rune circle that he told Mim about. You can ask him what the rune you received does. "So you ended up with my rune? Interesting. You're either working with the cat or you killed him. I'd prefer the latter, of course, but perhaps that's just me. Still, there's a way for everyone to win today." "The rune you carry is more powerful than you can imagine. If the cat knew its true potential, he would never have given it up. The power of the dead flows through the rune. Necromancy, some call it. But the rune serves another purpose, as well." "The death rune transforms you. Every death you deal in this form fills the rune. I intend to use the fully charged rune to escape this plane. Not even the Observer will be able to stop me. And I'll remember anyone who assisted me, of course." Tell me how the death rune works. "Use the rune within this circle and you will transform. Then the rune will absorb the essence of everything you slay. The more you kill, the stronger the rune becomes. But don't linger. The death rune's transformative power lasts only so long." After saving helping the three mages, the Observer will call you back to the clifftop to choose who to side with. You have the opportunity to speak with Thallik first and hear his proposal. "You appeared to enjoy the power I gave you. I, too, know how exhilarating the power of death and darkness can be. All this and more can be yours whenever you want it. If you join me in this campaign." You're offering me power to join with you? "Of course! What else is there? Power makes us happy. It lifts us up above the rabble. In life, I had such power that you wouldn't believe! I was foolish, though. I let it slip away." "I misjudged the … committment [sic] of others. It was a simple miscalculation, but it brought my entire base of power to a grinding halt. I won't make that mistake again, though. I'll use my power to its fullest extent. No one will stop me!" "Call it what you will. I lost because I miscalculated your committment [sic] to your cause. But your lust for power remains. Why fight to be a hero when you can fight for your true goal—power! All you have to do is join me." If you choose to join Thallik you can meet him in his camp down below. If you got him out of the game, Thallik can be found in the House of Darkness in the Hollow City. He will not like the place at all. "This city is dreadful. All the bright colors. The blooming flowers and trees. The … life! Maybe I should go back outside again. I think I prefer Coldharbour's stark landscape to this … wonderland." "Whoever lived here before had a splendid eye for decor. This will suit me just fine. We spend so much time worrying about what happens after life when we should be embracing death and the powers that come with it." This page was last modified on 30 January 2019, at 19:12.